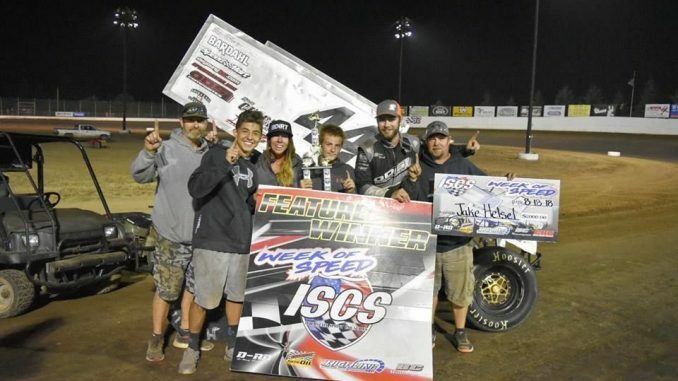 Elma, Washington- The sixth and final night of the inaugural Interstate Sprint Car Series Week of Speed had the tour return to Grays Harbor Raceway on Saturday, August 18th. Just like the previous evening thirty-two cars would fill the pit area representing the states of Washington and Oregon. Mount Vernon veteran Bill Rude grabbed the initial lead at the drop of the green flag. Rude received a bit of pressure on lap eight from Jake Helsel. Helsel, of Monroe, challenged Rude for the top position and unfortunately both drivers got together fighting over the coveted spot. Rude spun, while Helsel kept going, with Helsel becoming the new leader. Jake Helsel dominated the rest of the distance despite being briefly held up by lapped traffic. Helsel scored the win, his second of the week and the third occasion with the series, to close out the week. Harrisburg, Oregon teenager Tyler Thompson finished second over Tanner Holmes, from Jacksonville, Oregon, in third. The rest of the top five consisted of Sedro-Woolley driver Steve Parker, getting fourth, while finishing fifth was Arlington’s Brett McGhie. Qualifying was divided into four separate groups with Tanner Holmes, Bill Rude, Cottage Grove’s Kinzer Cox, and Burlington native Kelsey Carpenter, in the Bill and Stephanie Rude owned entry, all setting fast time. Heat race victors were Allison Journey of Lincoln City, Oregon, A.J. Harbaugh from McKenzie Bridge, Oregon, Sedro-Woolley’s Michael Bollinger, and Brett McGhie. Devin Barnes, of Edmonds, won the consolation feature while Kent’s Sean Johnson earned the Travis Rutz Hard Charger Award for passing the most cars in the main event. At the end of the night Tyler Thompson was the high point earner during the week thus capturing the ISCS Week Of Speed. The Interstate Sprint Car Series can’t thank enough all the wonderful race fans and teams that supported the first ever speedweek for the series. The final race of the campaign will occur on Saturday, September 29th at Coos Bay Speedway. The ISCS series would like to thank their series sponsors/marketing partners BC Motorsports, Highline Performance, NWSprintCarHistory.com, Champion Racing Oil, and Hoosier Racing Tires. For the latest news and updates regarding the Interstate Sprint Car Series be sure and visit their Facebook page.